Global Fund for Women was launching a major initiative to end child marriage. The fundraising goals were significant for the organization, and this was not a topic we had messaged on before. As we had built previous successful campaigns around violence against women and girls, I designed a multi-channel campaign that messaged heavily on violence against girls and early marriage as a form of violence. The campaign combined donor education, engagement, cultivation, and stewardship into a branded package called Safe World for Girls. The landing page offered engagement opportunities that maximized the benefits of user-generated content to create social media buzz and bring new supporters to the campaign. Graphics were shared across all online channels, with users providing their own responses to the questions on social media or on the website. Emails went out to supporters in the early weeks of the campaign, linking to success stories about the organization’s work to prevent violence against girls and early marriage. 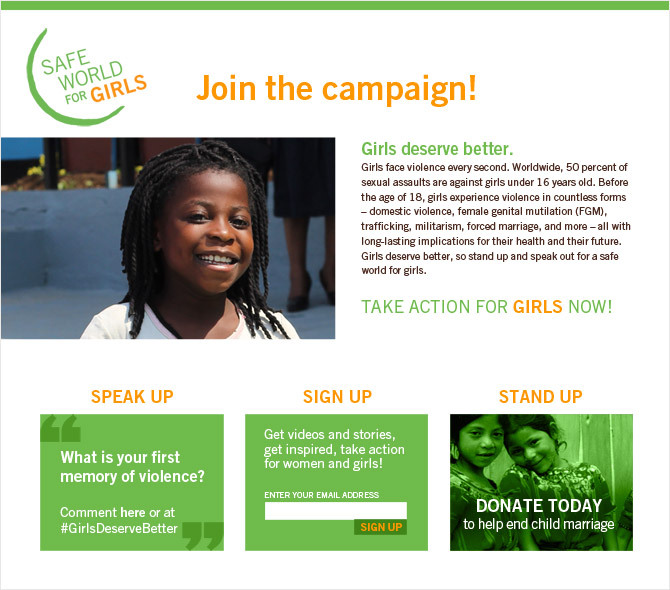 The emails and stories reinforced the “Safe World for Girls” brand and drove users to the campaign landing page and donation page, which was also customized to align with the branded messaging. Success stories were promoted on social media along with their photos and graphics. After making the case through powerful digital storytelling, we sent fundraising appeals through email and direct mail as well as social media. The timing of these appeals was set to correspond with International Women’s Day in order to maximize the campaign’s impact during a time when Global Fund for Women always has the spotlight. Online fundraising for this campaign outperformed the previous year’s International Women’s Day by more than 100%. The campaign brought almost 100 new donors to the Global Fund for Women, as well as hundreds of new email subscribers and 6,000 new social followers in just a few weeks.